CD reviews: "The Rough Guide to Cajun and Zydeco," "Who Stole My Monkey?" and "Turn the Page"
These reviews first appeared in the April 17, 1999 edition of the American Reporter. It isn't just for Mardi Gras anymore. Louisiana's Francophile folks musics, that is. The twin pillars of French culture in the United States, Cajun and zydeco have continued to ride a wave of popularity that first appeared nationally a decade and a half ago. Like their kissin' cousin to the north of the border, Quebecois, zydeco and Cajun are based on fiddle, guitar and  especially  accordion. Both are also based on traditional folk forms, and feature lots of two-step dances numbers along with more modern interpretations. But they are also derived of different and distinct traditions. The Cajuns are relative newcomers to Louisiana, having arrived only after the founding of the United States when they were expelled from Nova Scotia by the British during one of their intermittent skirmishes with France. The creoles  French-speaking blacks  are descended from the original French colonialists and their slaves, plus a substantial community of Haitian immigrants. So their dialects are distinct, as are their musics. Still, as the Rough Guide's compilation of Cajun and zydeco point out, there's much in common between the two schools  so much so that, to the unschooled non-Louisianan, they're more alike than different. "The Rough Guide to Cajun and Zydeco" is a solid, if sometimes uneven collection featuring 19 tracks by 18 artists (Buckwheat Zydeco is featured twice). There's no order here, just a random arrangement of the tunes, bouncing back from zydeco and forth to Cajun. The liner notes, taken from the "Rough Guide to World Music," are minimalist and don't offer much in the way of background or even introduction. Song selection is better than the liner notes, as the artists included are among the best from both schools: Steve Riley and the Mamou Playboys, the late Clifton Chenier, Beausoleil, Michael Doucet, Je-El Sonnier, Nathan and the Zydeco Cha Chas. Boozoo Chavis, who is inexplicably absent from the Rough Guide compilation, is one of the last links to zydeco's early days, when creoles created zydeco out of traditional French forms and postwar rhythm and blues. A contemporary of the late Clifton Chenier, Chavis had one of zydeco's first national hits in 1954 with "Paper in My Shoe." His new disc, "Whole Stole My Monkey"", shows the old master is still on top of his game. Leading a band including his sons through an energetic set of originals and covers, Chavis covers all the bases: traditional two-step, waltz, R&B, dancehall, blues. His accordion playing remains stellar, his vocals as spirited as ever. 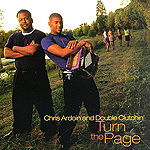 If Chavis is a link to the past, then Chris Ardoin's outfit, Double Clutchin', is the future of zydeco. Scion of one of the richest family legacies in the musical world (a great uncle, Amede Ardoin, was the first French-speaking Louisianan to record a record), Ardoin is helping to redefine zydeco and win it new fans among the younger set. Not yet old enough to vote, Ardoin has a second album out that picks up where his 1997 debut left off. Just as Chavis and Chenier combined the then-new sounds of R&B into their traditional music, so does Ardoin meld contemporary dance hall rhythms into his brand of zydeco. And the kid can play some mean squeezebox, too. His winsome solos belie his tender years, as he speaks with a musical voice of an accomplished master. With two polished albums under his belt before he casts his first vote, Chris Ardoin gives promise to the future of the music.